In an article published February 7th, the Consumer Finance Protection Bureau announced its plan to improve data collection under Regulation C, which implements the Home Mortgage Disclosure Act (HMDA). HMDA, which was enacted by Congress more than 35 years ago, was part of an initiative that helped counter redlining and the effects of disinvestment in urban neighborhoods. It requires financial institutions to maintain and annually disclose data about home purchase, home purchase pre-approvals, home equity loans, and refinance applications. Today, HMDA information (which is made available to the public) reveals lending patterns in the mortgage industry that is used by the CFPB to identify discriminatory practices. Since the CFPB acquired responsibility for Regulation C, new data points to HMDA have been added to include: the total points and fees, the term of the loan; the length of any teaser interest rates; and the borrower’s age and credit score. The Bureau is also convening a panel of small businesses to seek feedback and give regulators a better view of industry developments. It is considering proposals in relation to; the kinds of lenders required to report, the types of loans reported, the information in each loan, and operational improvements to the HMDA compliance system. Amended by the CFPB, the latest of three exemption changes to HMDA increased the exemption threshold of depository institutions from $42 million to $43 million for data collection in 2014. The following guide demonstrates CFPB proposals concerning Regulation C, it’s exemptions, collected data, and loan application register (LAR) reporting functions. In June 2010, the CFPB held public hearings on potential revisions to Regulation C. Accused of creating an “unlevel playing field for lenders” the Bureau identified coverage as one of the topics for discussion and requested comment on whether additional types of institutions should be reported and if others should be exempt. In some cases it was discovered that depository institutions making as few as one mortgage loan a year were under more regulation than non-depository institutions making substantially more loans. 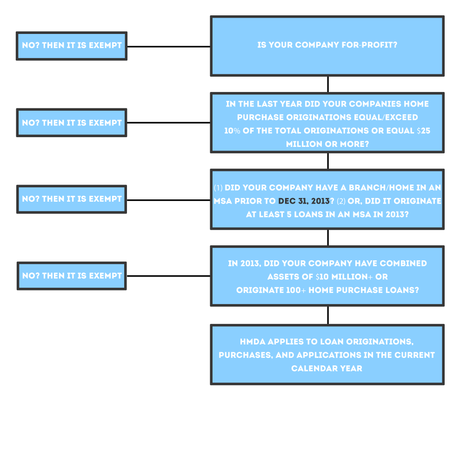 Before determining if a company is required to report HMDA data, there are currently several stipulations to consider. First, Regulation C exemption is based on the assets, loan volume, use of federally insured mortgage loans, and geographic location of the financial institution (see Diagram 1). 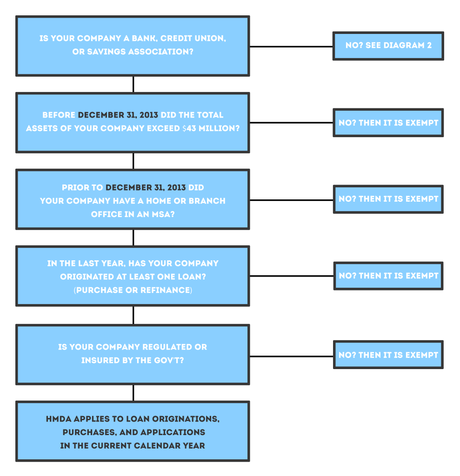 For-profit mortgage-lending institutions other than banks, savings association, or credit unions may also be considered covered under this law (see Diagram 2). To simplify these tests, a minimum volume threshold of 25 closed-end loans in a given year has been proposed in addition to the current location and asset-size test. The preliminary view of the CFPB is that the 25-loan test would eliminate financial institutions that are not significantly involved in originating home loans. 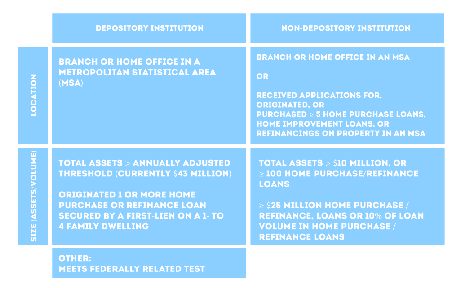 This would also eliminate the depository / non-depository system described in diagram 1 and 2. The types of loans that will be considered for this test, however, remain open to dialog. In addition to this amendment, the CFPB proposes a requirement for institutions to report all dwelling-secured loans rather than tying coverage to the loan purpose. It is believed that this will “establish a more streamlined, bright-line approach that may be simpler for financial institutions to apply than the current rules…” This proposal would: eliminate home improvement loans from reporting, capture all HELs and HELOCS, and capture all reverse mortgages. Regulation C currently requires approximately 24 pieces of information, called data points. When Dodd-Frank initially amended HMDA, it added new data points and expanded others. Although this is not required yet, this included: the total points and fees, rate spread for all loans, prepayment penalty term, introductory interest rate term, non-amortizing features, loan term, application channel, universal loan ID, loan originator ID, property value, parcel ID, borrower’s age and credit score. The Bureau has proposed several new points to be included on the HMDA dataset in addition to the data points presented above. These include: AUS results, denied applications, qualified mortgage status, additional points and fees, construction method (instead of property type), deed restriction, manufactured housing information, DTI, and unique entity identification number. How will it be reported? Annually, covered financial institutions across the nation must submit their annual loan application register to the Federal Financial Institutions Examination Council (FFIEC) by March 1st. In turn, the FFIEC screens the data for errors and releases it to the public electronically through public disclosure statements for every institution and for every metropolitan statistical area (MSA) and metropolitan division (MD). For now, this is done by email, CD, or web submission via the free HMDA Data Entry Software. This software is required because financial institutions must submit their data in automated, machine-readable formats that conform to the loan application register. The current software, however, has several limitations. As it is installed on individual hard drives, it is impossible to be accessed by multiple users and cannot be entered at different branch locations. As new versions are developed every year, submission requires the process of downloading new software before every submission. Challenging this, the CFPB proposes to allow integration of HMS third-party software’s using an API, which would allow direct submission from their HMS software and provide a shared workspace for entering and validating information. By aligning the requirements of Regulation C data submission to existing industry standards. It lightens the burden of using additional software to submit. By adapting to the widely used Mortgage Industry Standards Maintenance Organization (MISMO) data standards, the Bureau believes that adding new data in the future will be less burdensome. Another solution the CFPB proposes is creating an improved web-based HMDA Data Entry Software. A cloud-based and streamlined version of the current software, this more efficient system would alleviate the on-going operation costs incurred when collecting data. Discover how MortgageDashboard keeps loan officers compliant.